Any informed list of the 10 all-time best rock guitarists should – without question – include Eric Clapton, Jeff Beck and Jimmy Page. The Yardbirds, who are playing the Colonial Theatre (Bridge Street, Phoenixville, 610- 917-1228, www.thecolonialtheatre.com) on March 28 are a bit like the Black Knight in the movie “Monty Python and the Holy Grail.” The Black Knight challenges King Arthur who then cuts off the knight’s left arm. The Black Knight continues to fight and loses his other arm. Eventually, he is totally dismembered by Arthur. Still, he keeps going through all the adversity. In 1966, bassist Paul Samwell-Smith left the group. Jimmy Page joined and the band used a double-lead guitar format for a brief while. Then, Beck left, and Page remained – but only for a short while before leaving to form Led Zeppelin. In 1976, vocalist Keith Relf died in an accident leaving the band with just a pair of original members – drummer Jim McCarty and rhythm guitarist/bassist Chris Dreja. The group seemed to quietly fade into history. 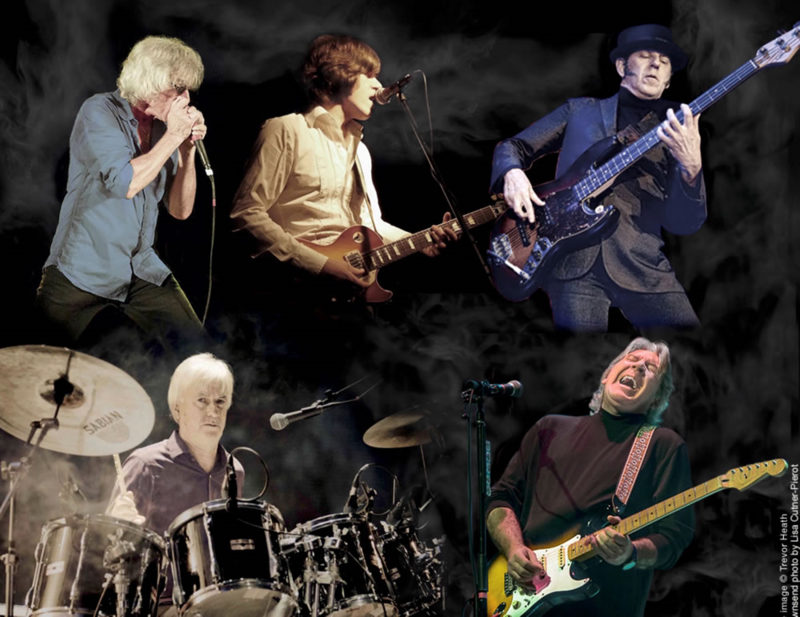 Then, in 2003, the Yardbirds regrouped and recorded their latest album “Birdland.” The band’s lineup included McCarty and Dreja along with other young British musicians. Dreja sat out the US spring 2012 tour to recover from an illness. It was announced in 2013 that he was leaving the band for medical reasons and would be replaced by original Yardbirds guitarist Topham. Then, Topham left. On August 12, 2015, it was announced that Boston guitarist Johnny A. would become the newest member of The Yardbirds. He was with the band for a while and then he too departed. The Yardbirds’ lineup now features critically-acclaimed original drummer/composer/ Rock and Roll Hall of Fame inductee Jim McCarty; lead vocalist/rhythm guitarist John Idan, whose tenure with the band began in 1992; bassist Kenny Aaronson, who has worked with Billy Idol, Joan Jett, and Hall and Oates; lead guitarist Godfrey Townshend, who has performed with rock luminaries such as John Entwistle and Jack Bruce; and Myke Scavone, (who is also lead singer in The Doughboys) on harp, percussion and backing vocals. “It’s the same line-up we’ve had for a while except for our new guitar player Godfrey Townshend, who is the musical director for the ‘Happy Together’ tours,” said McCarty, during a phone interview last week from a tour stop in Connecticut. “This is his first time to play with the band. The rest of the guys have been around since 2015. The Yardbirds’ personnel may change every once in a while, but the set list with a slew of classic songs remains constant. The Yardbirds’ most recent albums are “Birdland,” which was released back in 2003, and “Making Tracks,” which came out in 2013. “We’re talking about recording a new Yardbirds album — classic bluesy-type thing,” said McCarty. “We’ve thought about getting back in the studio. The chemistry with this lineup is good. There are no egos and they’re all good guys. For a band that really wasn’t around that long (just over five years in its original incarnation) and never really had a string of monster hits, the Yardbirds left an indelible imprint on rock music. Taking their name from Jack Kerouac’s writing (“yardbirds” were hobos that hung around railroad yards and hopped trains), the Yardbirds evolved from the Metropolitan Blues Quartet, a seminal British band put together by guitarist Paul Samwell-Smith and vocalist Keith Relf. 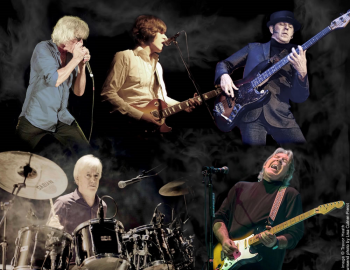 They added Chris Dreja (guitar), Jim McCarty (drums) and a 16-year old guitarist Tony “Top” Topham to complete the original Yardbirds’ lineup. Topham was pressured by his parents to return to school and a then unknown British blues guitarist named Eric Clapton replaced him. Clapton was the first of three “Guitar Gods” to handle lead guitar duties for the Yardbirds. His tenure lasted for one very blues-oriented studio album and a live album of the band backing blues legend Sonny Boy Williamson. The Yardbirds’ final guitarist was Jimmy Page, who was with the group for one album. Page then formed the New Yardbirds — a band that was the embryo of Led Zeppelin. Most of the Yardbirds’ groundbreaking music came during the three-year period when guitar master Jeff Beck was the group’s lead guitarist. Beck’s innovative and emotive style of playing stretched the boundaries of traditional rock and opened the door for new improvisational and experimental aspects of rock and roll. “The original band was together for five years,” said Dreja, during a previous phone interview. “But, it felt like 20 years with all the miles traveled and music played. It started to fade around 1968. Dreja and McCarty brought the Yardbirds back to life in 2003. Now, with Dreja sidelined, it is up to McCarty to carry the banner. Video link for the Yardbirds (1965) — https://youtu.be/HU5zqidlxMQ. Video link for the Yardbirds (current) — https://youtu.be/PYnkPBnn4mg. Take a talented jazz/rock/avant-garde guitarist, one of the best bassists in rock and a highly-respected drummer, put them together onstage for an evening of complex compositions that have room for improvisation, and you have the formula for the show on March 28 at Johnny Brenda’s (1201 North Frankford Avenue, Philadelphia, 215-739-9684, www.johnnybrendas.com). 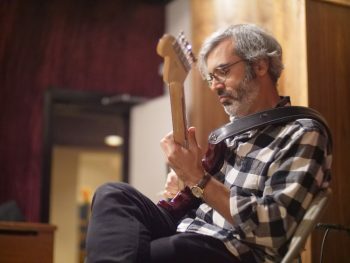 On Thursday night, Ars Nova Workshop is presenting a concert featuring guitarist Mike Baggetta, bassist Mike Watt and drummer Stephen Hodges at the popular club in the Fishtown section of Philadelphia. Baggetta, a veteran New York musician, is versatile enough to go from swinging modern bop chops that flow like John Abercrombie to whammy bar pedal steel licks influenced by his first guitar hero, David Torn. The trio also features Hodges (Tom Waits, Mavis Staples, David Lynch) and Minutemen bassist Mike Watt, whose wide-ranging career spans work with Iggy Pop and the Stooges and fIREHOSE. This show celebrates the release of Baggetta’s new album, “Wall of Flowers” (Big Ego), featuring Watt and legendary drummer Jim Keltner. My friend Chris Schlarb, who owns Big Ego Records, asked if I wanted to do a record for him,” said Baggetta, during a phone interview Tuesday afternoon s the band travelled from Minneapolis to a show in Chicago. Baggetta’s latest album “Wall of Flowers,” is already garnering massive attention. It features a reimagining of his music alongside an unlikely but bound to be legendary rhythm team. “We made the album in just one day with me, Watt and drummer Jim Keltner,” said Baggetta. “I did have a lot of songs I had written before the session, but we ended up using only two of them. “Some of the songs were used were compositions and some were free improvisations. We just improvised for three or four hours. Later, I went back and chopped some of the improvisations. I like that the music blurs the lines between compositions and improvisations. Keltner, who is described as “the leading session drummer in America,” is well known for his session work on solo recordings by three members of the Beatles, working with George Harrison, John Lennon (including Lennon solo albums, as well as albums released both by the Plastic Ono Band and Yoko Ono), and Ringo Starr. He has worked with everyone from Jerry Lee Lewis to Todd Snider to Bob Dylan. Hodges is an American percussionist and composer. He is best known for his work with Mavis Staples, Tom Waits, Mike Watt, T Bone Burnett, Rick Holmstrom, and film director David Lynch. Watt is a bassist, vocalist and songwriter. He is best known for co-founding and playing bass guitar for the rock bands Minutemen, Dos, and fIREHOSE. He is also the front man for the supergroup Big Walnuts Yonder, a member of the art rock group Banyan and involved with several other musical projects. From 2003-2013, he was the bass guitarist for The Stooges. “When the album came out, we were getting ready to tour,” said Baggetta, a New York City resident who grew up in Agawam, Massachusetts. “Jim doesn’t travel anymore. I asked Watt to find another drummer. He said – get Stephen Hodges…right now, he has time off from playing with Mavis Staples. Video link for Mike Baggetta – https://youtu.be/wTh3J6jKHQ4. The show at Johnny Brenda’s will start at 8 p.m. Tickets are $18. Another upcoming Ars Nova show is Boneshaker and Jajouka Baraka on April 1. When George Stanford headlines a show at The Locks at Sona (4417 Main Street, Manayunk, 484- 273-0481, sonapub.com) on March 29, it will be a homecoming for the talented singer/songwriter. Stanford graduated from Harriton High School, attended Philadelphia’s University of the Arts and was a driving force in the Philly-based band Townhall. The multi-instrumentalist relocated to the West Coast in the mid-2000s but still has a fondness for the Philadelphia area. Stanford is coming back with a new EP. But it is not a support tour for the new release. “This is just a hometown one-off,” said Stanford. “I’m going back to L.A. to score a short film. I’m doing film work whenever I can. I’ve already done a handful of feature films. “I just put out a solo EP called ‘Alone at the Pilgrim.’ I recorded it in a huge, old, empty closed church. Acoustically, it sounds wonderful. I’d been looking for a space like this for a while. I wanted to record in a big space – to play stripped-down songs in a big, big room. The EP has five songs – each of which has an accompanying video. Stanford took advantage of the session to record more than just the five songs on the EP. “I recorded an album’s worth of songs,” said Stanford. “I wanted each song to have a video and we only had time to track five videos. It has four originals and one cover. I did a cover of Tom Petty’s ‘I Won’t Back Down’ to pay homage to one of my influences. Stanford honed his musical skills at Philadelphia’s University of the Arts. The multi-instrumentalist abandoned the academic world midway through his tenure for a life on the road with eclectic Philly rock act Townhall — a relationship that lasted five years. When Stanford first moved to Los Angeles in 2006, he landed a record deal with Epic Records and then moved to Smash/Mercury Records the following year. He moved back to Philadelphia, and released his debut album, “Big Drop,” in June 2008. It was preceded by an EP and the lead single “My Own Worst Enemy,” which was featured on VH1’s “You Oughta Know” program. After his departure from the label, he formed his own independent label gbones Music and released the EP “Roll Away” in 2010 which featured his biggest single to date, “Meet Me in L.A.” He followed it up with the “Las Palmas” EP in 2012 and an artist residency at The Piano Bar in Hollywood. His second studio album, “Something Better” was released in 2014, and featured the track “Happy As You Are,” which was featured on Amazon.com’s “Artists on the Rise” series. In 2015, he worked on the soundtrack to the feature film “The Grace of Jake” starring Jordin Sparks and Michael Beck and followed with songs on a number of other film scores. Growing up in Narberth, Stanford’s music tastes as a teen were helped along by the owners of Shady Dog Records, a shop in Narberth that sold used and new albums and CDs and specialized in rare discs. Shady Dog Records is still going strong – but not in Narberth. 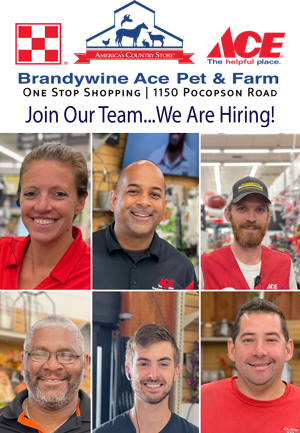 Like Stanford, the shop moved west – not to Southern California but to Berwyn. The owners are still are turning on people to new music at their current location at 638 Lancaster Avenue (610-644-1160) and online (shadydogrecords.tumblr.com). Video link for George Stanford — https://youtu.be/RBuG97fkGHY. The show at The Locks at Sona, which has Jena Nichols as the opening act, will start at 8 p.m. Tickets are $10. Other upcoming shows at the venue are Peter Mulvey with special guests Lizanne Knott and John Smith on March 28, Steve Forbert on March 30 and Tracy Bonham & Blake Morgan on April 3. The Rrazz Room (6426 Lower York Road, New Hope, 888-596-1027, www.TheRrazzRoom.com) is a music venue located inside the Clarion Inn & Suites. After this weekend, the Rrazz Room will become a music venue that used to be located inside the Clarion Inn & Suites. Suede. Photo by Carol A. Hill. The owners are looking for a new venue to host their club. This weekend will mark the final two Rrazz Room shows in its current incarnation. On March 30, “Chaslyn Sweetwood presents Les Adieux Revue” will be the venue’s final presentation. On March 29, Rrazz Room favorite Suede will perform and bid farewell to one of her most-loved places to perform. 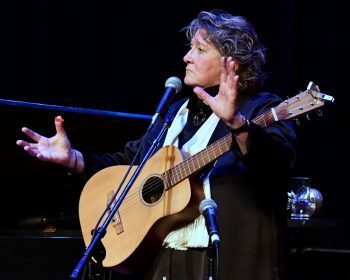 Suede, a veteran entertainer who is billed as “a cross between Adele, Diana Krall and Bette Midler,” has performed many memorable shows in the comfortable music room in New Hope. According to Suede, “So. The short version is — RRazz Room New Hope is closing in this venue. This weekend’s shows are the last scheduled. As far as I know, owners Robert and Rory are seeking another New Hope area venue, but I have no idea how that’s coming along. Pop/Jazz/Blues phenom Suede plays piano, guitar and trumpet, but voice is her first instrument and entertaining is clearly her first love. She is a consummate entertainer and song stylist among the likes of Tony Bennett and company. A native of Nyack, New York, Suede knew early on that she wanted to make singing her life. Her natural talent wowed friends and family throughout her childhood, culminating in her first bar gigs while still in high school. Completely self-taught until her college years, Suede then began formal training in classical voice and trumpet. She obtained a Bachelor of Music degree before launching her musical career shortly after graduation. “Three decades plus and I’m still making my living through music,” said Suede. “There are times I think – how am I still doing it? It’s the best drug I’ve found. There’s nothing better than rehearsals with my band or getting on stage to perform for people. The RRazz Room is a favorite club for this world-touring singer and multi-instrumentalist and Suede is a favorite of The Rrazz Room’s as well. She returns to the venue one last time with her pals and fellow musicians Tomoko Ono on piano and Amy Shook on bass. “These are really great musicians,” said Suede. “Tomoko Ono is from New York and is a member of the Diva Jazz Orchestra. Amy Shook is a very talented bass player from Washington, D.C.
“I play piano, guitar and trumpet but in live shows, I usually leave the piano to the band. Voice is the primary focus for me. I’ve always approached it as an instrument. I sing words in a certain way. Suede retains anonymity with her mono-syllabic stage name. Suede has been making albums and DVDs since 1988 but her live show has always been her forte. Video link for Suede — https://youtu.be/PXK-EREQWck. The show at the Rrazz Room March 29 will start at 8 p.m. Tickets are $40 and $50. 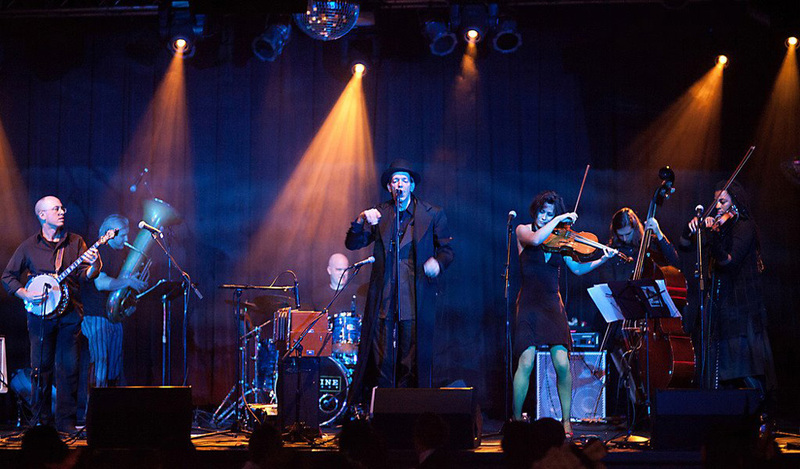 If you have broad tastes in music, then Beat Circus is a band you’ll probably enjoy – especially when it plays live on March 29 at Kung Fu Necktie (1248 North Front Street, Philadelphia, 215-291-4919, kungfunecktie.com). 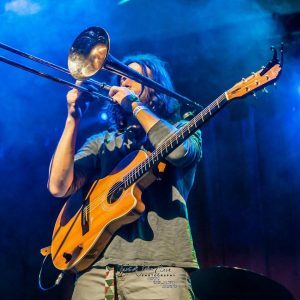 Beat Circus is a band from Boston fronted by the multi-instrumentalist/singer-songwriter Brian Carpenter, who has been its only constant member since its inception. Beat Circus bridges a number of disparate genres ranging from cowpunk to “spaghetti western” and giallo scores. Carpenter’s broader resume includes recordings and performances with Swans, Kronos Quartet, Colin Stetson, Marc Ribot, and Roswell Rudd, and collaborations with producers Martin Bisi (Dreamland, 2008), Sean Slade and Bryce Goggin (Boy from Black Mountain, 2009). Carpenter is also currently working on a new album with Ghost Train Orchestra and Kronos Quartet re-imagining the music of Louis Hardin, aka Moondog. Beat Circus’ songs are characterized by lush arrangements, eclectic instrumentation, and Carpenter’s lyrical themes of love, death, religion, and American mythologies. The music draws heavily from all sorts of genres including experimental music, modern classical, cabaret, circus music, Appalachian string music, bluegrass music, old-time music, Southern Gospel and funereal music. “These Wicked Things” also features an 18-page graphic novelette by renowned Croatian artist Danijel Zezelj, best known for his live paintings, multimedia, and collaborations with DC Comics/Vertigo. Carpenter formed Beat Circus in 2002 shortly after his arrival in Boston and since then, he’s been the ensemble’s guiding light and sole constant member. The current line-up features Carpenter, vocals, guitar, harmonica, organ; Abigale Reisman, violin, vocals; Emily Bookwalter, viola, vocals; Andrew Stern, guitar; Alec Spiegelman, reeds; Paul Dilley, bass; and Gavin McCarthy, drums. “These Wicked Things” began in Berkeley, California when Carpenter was commissioned by the Berkeley Repertory Theater to compose music and lyrics for Dominic Orlando’s play “The Barbary Coast” in 2014. Based on the true crime book by Herbert Asbury (Gangs of New York), “The Barbary Coast” detailed the violent rise of San Francisco in the late 1800s. The play centers around Joaquin Murieta, the real-life inspiration for Zorro, a Mexican who went on a notorious revenge spree after his wife Rosita was killed by gold miners. Two versions of “Rosita” and some incidental music from the play are included. “We recorded ‘These Wicked Things’ in 2016 – and some of it even before that,” said Carpenter, during a recent phone interview from his home in Arlington, Massachusetts. “Some of the songs were based on a play we were commissioned for. Only a few of those songs made it to the record. After recording “These Wicked Things” with Beat Circus at the legendary Q Division Studios in Boston, Carpenter flew out to Tucson, Arizona to mix the record with esteemed producer Craig Schumacher (Calexico, Neko Case, Giant Sand). Carpenter worked with Schumacher previously on his singer/songwriter outing “The Far End of the World” (2015, Accurate). Special guests on These Wicked Things include trumpeter Jacob Valenzuela of Calexico, bass saxophonist Dana Colley of Morphine, and guitarist Stephen Ulrich of the NYC guitar noir trio Big Lazy. “These Wicked Things” is the band’s first release in 10 years, following “Boy From Black Mountain” in 2009. During this period, Carpenter released four albums with Ghost Train Orchestra in Brooklyn, NY, and a debut album with Brian Carpenter & The Confessions. “I had started this trilogy of records in 2006,” said Carpenter, who grew up in Florida before relocating to Massachusetts. “This was a way to finish it. “The original idea of the trilogy was to take American folklore re-imagined and use it as a backdrop. The first part was influenced by American circus and a lot of trips to Coney Island. The second part was influenced by Southern Gothic literature. “My mom’s family was from Birmingham and my dad’s family was from the Florida Panhandle. The third part was always supposed to be the ‘Wild West.’ So, this play fit right in. The record covers a lot of ground – cow-punk, spaghetti westerns, mariachi. Video link for Beat Circus — https://youtu.be/lsQEaQNVI7U. The show at Kung Fu Necktie, which also features Gringo Motel, and The Rectors, will start at 8 p.m. Tickets are $10. Other upcoming shows at Kung Fu Necktie are Lucifer on March 28, Mike Mains & The Branches on March 30, Surfer Joe on March 31, Something Like A Monument on April 1, Bad Sandy on April 2, and Good. Clean. Fun on April 3. 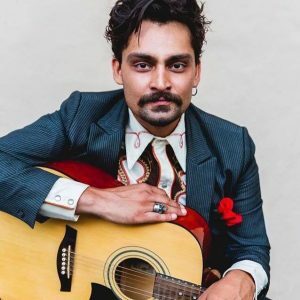 Like so many musicians, Ali Awan, who will perform on March 29 at Underground Arts (1200 Callowhill Street, Philadelphia, http://undergroundarts.org), got started in music by being exposed to music listened to by parents and relatives. “I always loved music,” said Awan, during a phone interview Wednesday afternoon from his home in Abington. “My mom always listened to good music classic divas like Aretha Franklin and Beyonce and good rick-and-roll like early Aerosmith. When I got a little older, I was exposed to other music by my uncle Mahmut, who was a Deadhead and a fan of Lou Reed. ‘Once I was 14, me and my friends would go in town. There was a place in Philly called Halfway House that had concerts. I saw my first show there. Things kept progressing at a steady rate. Awan released “Butterfly” on February 22. The seven songs on the EP were written and produced by Awan (who also plays guitar), engineered by Joshua Aaron Friedman and feature performances by Kirby Sybert (Kirby & the Vibe Tribe, Mo Lowda and the Humble) and Daniel Rice (The Dawn Drapes) on electric guitar, John Coyle (Catbite, Insignificant Others) on bass, Keaton Thandi on drums, Sean Hur (Ruby the Hatchet, West Kensingtons) on organ and Marc Pikulski on tambourine. “We recorded the EP at Hi5 Studio, which is located in Philly at Fifth and Girard,” said Awan. “We were in the studio for five days. Video link for Ali Awan — https://youtu.be/toBAbxKlgEc. The show at Underground Arts, which also features RFA, Secret American and Ritual Talk, will start at 9 p.m. Tickets are $12. Other upcoming shows at Underground Arts are Ramallah on March 28, and Black Audio on March 30. Another Abington High grad will be performing in the area on March 29 when AHS alumni Steve Berlin and his bandmates in Los Lobos headline a show at the Keswick Theater (291 N. Keswick Avenue, Glenside, 215-572-7650, www.keswicktheatre.com). The Keswick will also present “Ruben Stoddard Sings Luther Vandross” on March 31. Kennett Flash (102 Sycamore Alley, Kennett Square, 484-732-8295, http://www.kennettflash.org) will present “Broadway Sing Along Night” hosted by Calabrese Performing Arts on March 29 and The Dukes of Destiny on March 30. The Steel City Coffee House (203 Bridge Street, Phoenixville, 610-933-4043, www.steelcitycoffeehouse.com) will host “Open Mic Night” on March 28, and Betterducks with special guest Cookie Rabinowitz on March 30. Chaplin’s (66 North Main Street, Spring City, 610-792-4110, http://chaplinslive.com) will have Space Donkey and the Moonbouncers, Pet Lizard, and Kings Arms on March 29. The Ardmore Music Hall (23 East Lancaster Avenue, Ardmore, 610-649-8389, www.ardmoremusic.com) will present The Soul Rebels with special guest Rakim on March 28, Jah People + Big Mind + CRUCIAL on March 29, Breakwater + Instant Funk on March 30 and Antonio Sanchez & Migration along with Nels Cline/Chris Lightcap Duo on April 3. The Sellersville Theater (24 West Temple Avenue, Sellersville, 215-257-5808, www.st94.com) presents Jersey Corn Pickers and Boulevard Express & The Cheddar Boys on March 28, Pete Correale with John Ager on March 29, David Archuleta on March 30, Michael Glabicki on March 31 and Jackopierce with Chapell on April 3.